Washing dishes! Oh, the thing I don’t' want to do but have to do. Luckily, the dishwasher is a huge help, but there are many items I prefer to wash by hand. I like to hand-wash my plastic containers, pans, and cutlery. When it comes to washing my knives, I try to take every safety precaution that I can, especially since I have cut myself before while washing the dishes. All because I couldn’t see what end of the knife I was picking up. Recently, I had the opportunity to try out a new kitchen item ‘The Sink Safe’. The Sink Safe is a multi-purpose knife caddy which helps protect your hands from knife mishaps while washing your dishes. Its unique design allows your sudsy water to seep in and soak your knives (or other small or fragile items), while you load the dishwasher or hand wash your dishes. When finished cleaning your knives, you can store your sponges inside and let them air dry! Makes for a great addition on your countertop or under your sink. The Sink Safe offers so much more than just safety. When I am preparing food I can place the caddy by the cutting board. After I have finished using my knives, peelers, or any of my utensils that are sharp, I can put them into the caddy. I do make sure to place all my handles in one direction (A little-added safety never hurts.) I can then pick up my Sink Safe and transport it to my sink area. Either behind my faucet, by my sink, or even in my sink. When I am washing my dishes, the Sink Safe fits very easily into my sink. 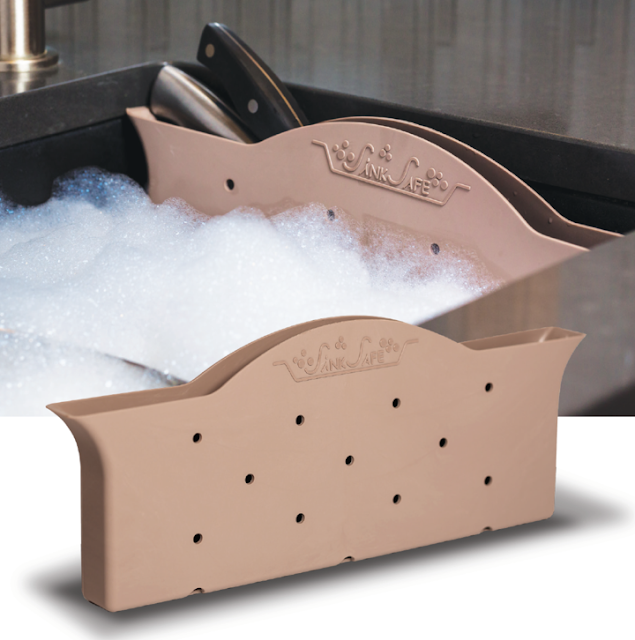 The designed holes are perfect for allowing hot soapy water to get into the Sink Safe. This allows your knives to start soaking. Once I am done washing my knives I can use the caddy for storing my reusable sponges. If you would like to store your knives in the Sink Safe you could do that. The caddy would fit nicely into any cabinet area. Whether you like to have the Sink Safe under your sink or on top of your sink, it makes for a great addition to any kitchen. Its use offers versatility, looks great with any scheme, and most importantly, provides safety in your day-to-day food preparation.